Mountain Melody Women’s Chorus presents a delightful program of Holiday music at venues all around Calaveras County. The group showcases traditional Christmas carols as well as contemporary songs in a program that is uplifting and family friendly. “Winter’s Child” is the title of the show, as many of the tunes tell the story of the Christ child and His humble birth in Bethlehem. The acapella song “Mary Sat A-Rockin'” is an uptempo rhythmic romp that has elements of gospel and rock music. “Can You Hear the Angels,” and “Oh What a Wonderful Child” have a joyful gospel sound that will get you moving to the beat, clapping along, and maybe even shouting hallelujah! “The Wexford Carol” and “The Coventry Carol” are more traditional arrangements of classic Christmas carols with beautiful melodies that are sure to bring back memories. The Ladies of Mountain Melody are known for their lush, blended harmonies and mellow tone that fits perfectly with the moving tunes that make up our Holiday program. We would love to see you at one of our performances! 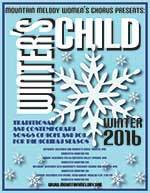 Mountain Melody Women’s Chorus Presents “Winter’s Child” traditional and contemporary music for the Holiday Season.